Join us for a holiday or a stay at the 4-star LES ILES campsite in Eure in the Centre-Val de Loire and Normandy region. 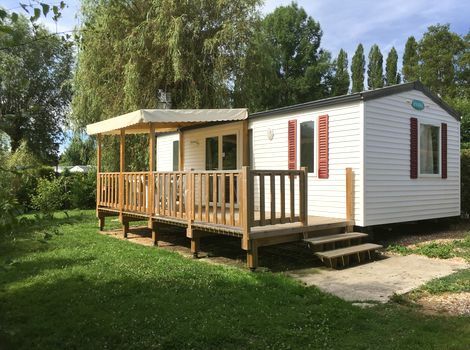 In The Eure from one of the most beautiful sites in the Eure Valley, our riverside campsite in Ivry-La-Bataille is ideally located 45 minutes from Paris (Porte de Saint-cloud – access by A13 and N12). With its 10 hectare park of greenery located 500 m from the centre of Ivry la Bataille, the campsite is bordered by 600 m of Eure riverbank and has 2 ponds for fishing only. 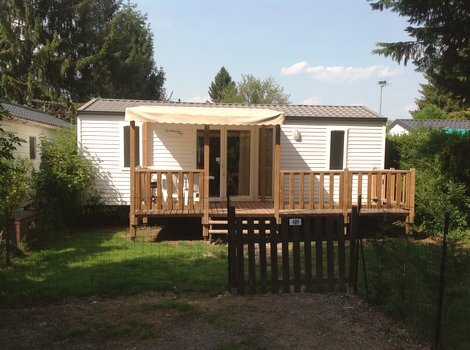 In our 4-star campsite in Eure, with 230 pitches and 7 rental accommodations, we offer you the rental of mobile homes by the week, weekend or month. The campsite has adapted sanitary facilities for people with reduced mobility (PMR). We do not offer camping spaces for tents, caravans or motorhomes. We are a Residential Leisure Park (PRL) and we offer you the opportunity to become a resident in our friendly and family campsite on spacious pitches. Indeed we have very comfortable pitches, closed by vegetable hedges and they measure on average 300m². The park has a choice of new and used mobile homes among many brands. 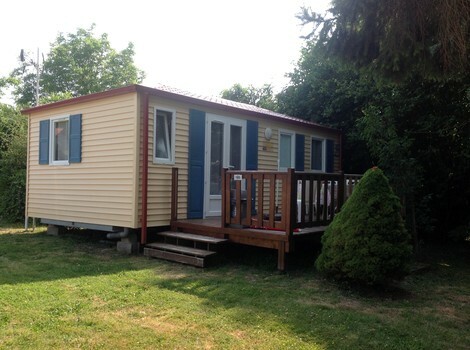 If you wish to become a resident, you can buy a mobile home through our services, but also rent a plot of land all year round. We are at your disposal to study your project together. For moments of relaxation or your aquatic leisure, enjoy the campsite’s indoor heated swimming pool. A swimming pool with paddling pool for children, which will allow everyone to spend a wonderful holiday, and to be able to refresh themselves, swim or dive in pleasant water throughout the day. The campsite offers entertainments, dance evenings and shows. We have two ponds only accessible for fishing enthusiasts (swimming is prohibited). For your leisure time, a desire to move or rather relax, we offer activities for all: petanque, basketball, volleyball and table tennis. Children will also be able to enjoy the playgrounds at their disposal, and find at the reception desk a set of games available for everyone. The campsite is open from 9 March to 9 November 2019. Are you looking for a campsite with a covered and heated swimming pool for your next holiday in Eure et Loir? You are then in the right place, at Camping Les Iles, to enjoy from our 4 star campsite, the indoor swimming pool and a paddling pool with secure access.